You can create both single posts and “sets” of them. All the tools to create posts are in the Posting tab. Important: note that you can see all your scheduled posts including stories, made with the Planner, in the same tab. An easy filter above will help you sort them if necessary. Press Add post – and the unified posting form with the single post form will appear. To add a photo or a video, you can either press Add media or drag files into the dotted field. 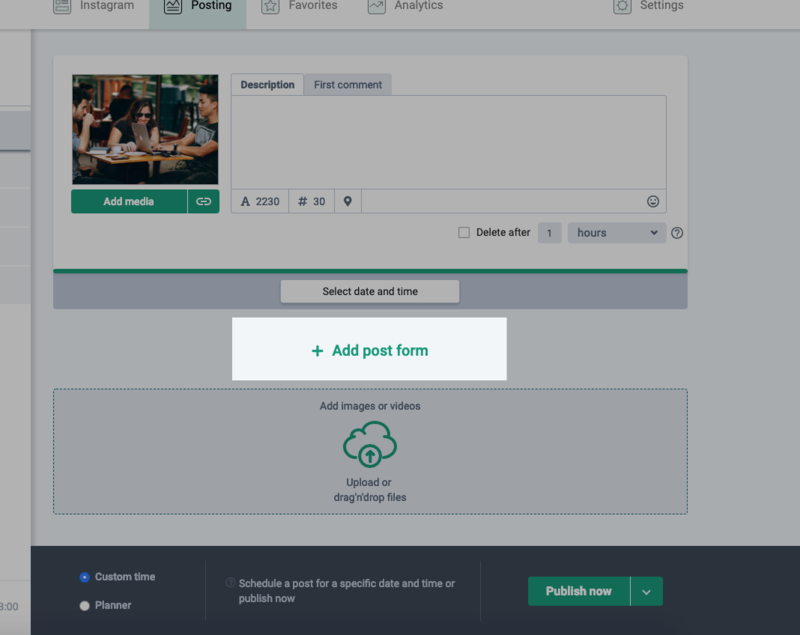 Depending on a social network on which you are going to publish your post, different options are available: adding a geotag, adding hashtags, tagging users on photos, adding the first comment. To make a post be published as soon as possible, press the Publish now button below. If you want to schedule a post for a specific time, select a date and a time slot and press Schedule. 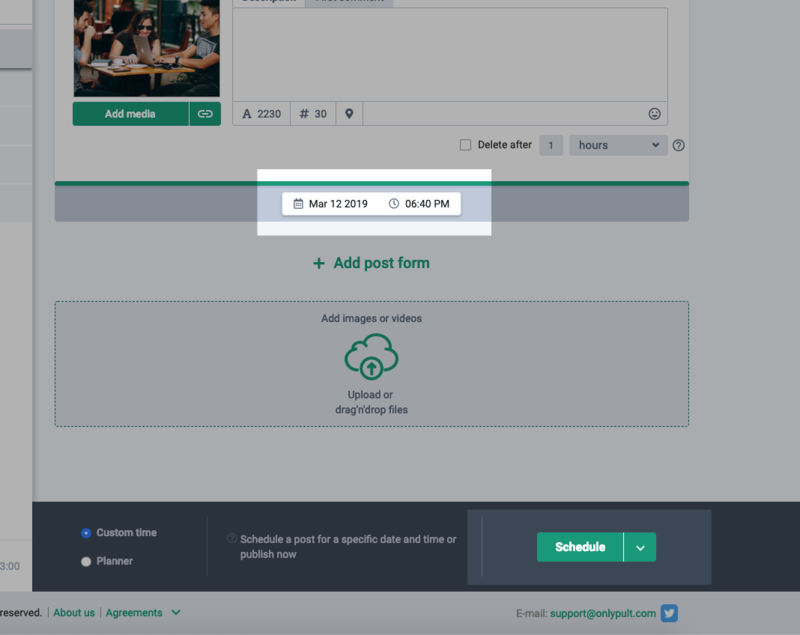 You can schedule up to 20 posts at a time using multiposting. Press Add post – the unified posting form with the single post form will appear. Drag media files into the big dotted filed. 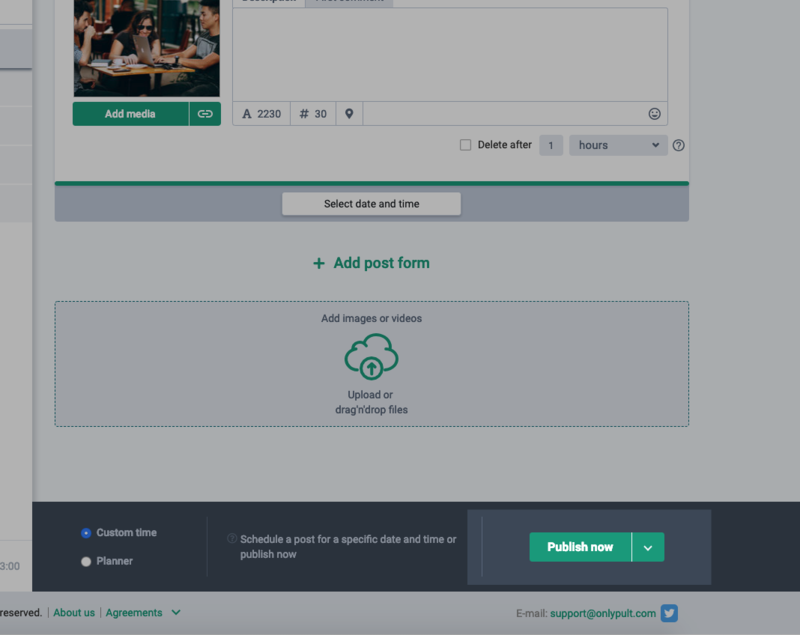 Note that you can add text and the first comment not only to each post separately but also by adding the general description – it will be automatically added to all posts. 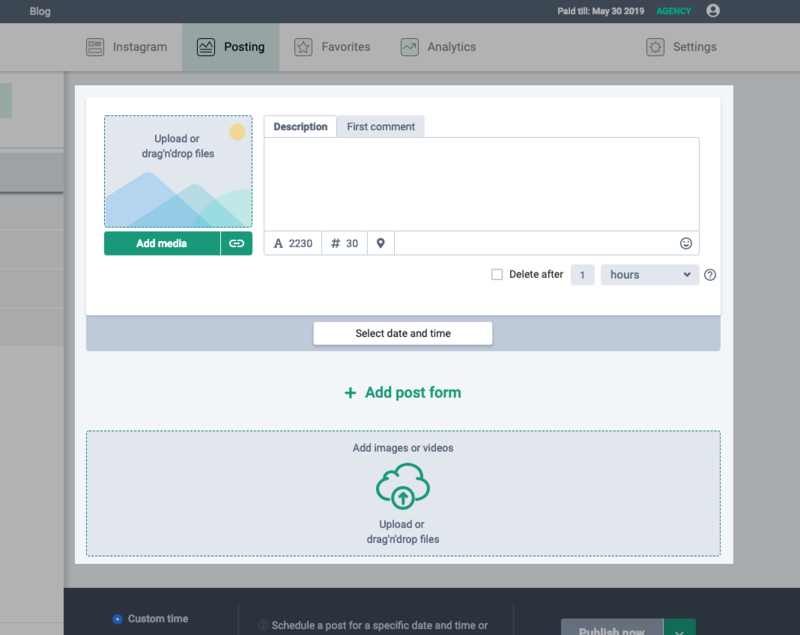 You can also add hashtags and geotags to and set automatic deletion for all posts. A gallery post is a post containing several media objects in the form of a slider. As soon as several files are unified in one post, the post becomes a gallery post (this type of posts is called “carousel” on Instagram). 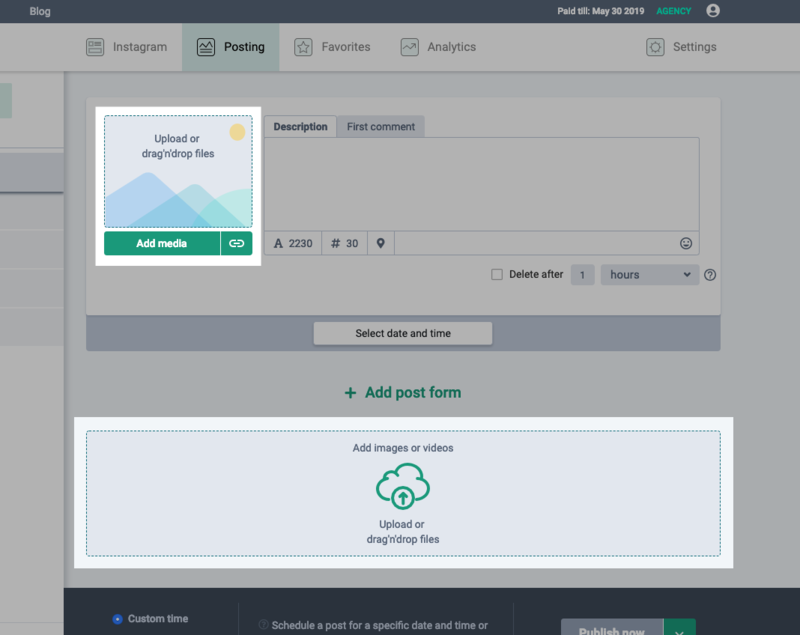 After uploading files, you can edit the order and each image separately with the photo editor. If you create a carousel on Instagram, you can also tag a user on any image. Important: currently only images can be uploaded to a gallery post. 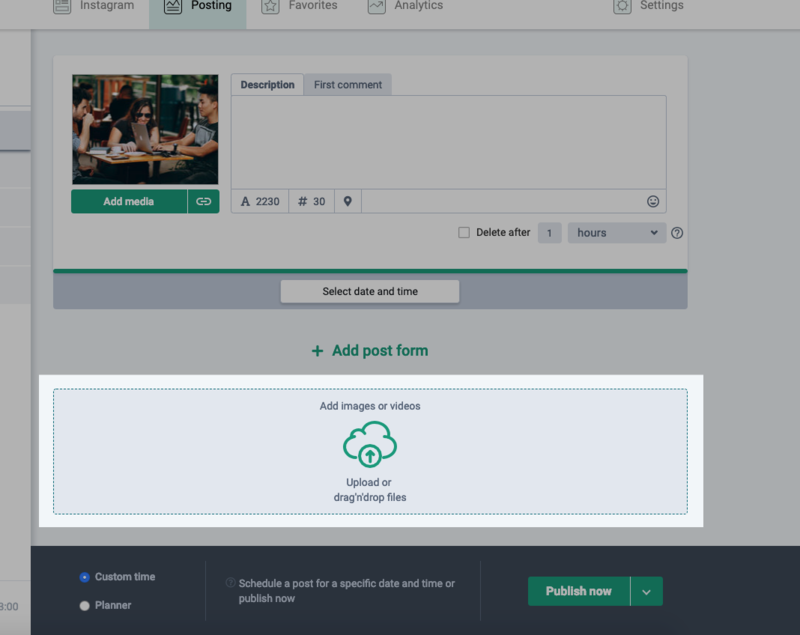 You can create video posts like any other ones: either by pressing Add media or dragging a video file into the dotted field. 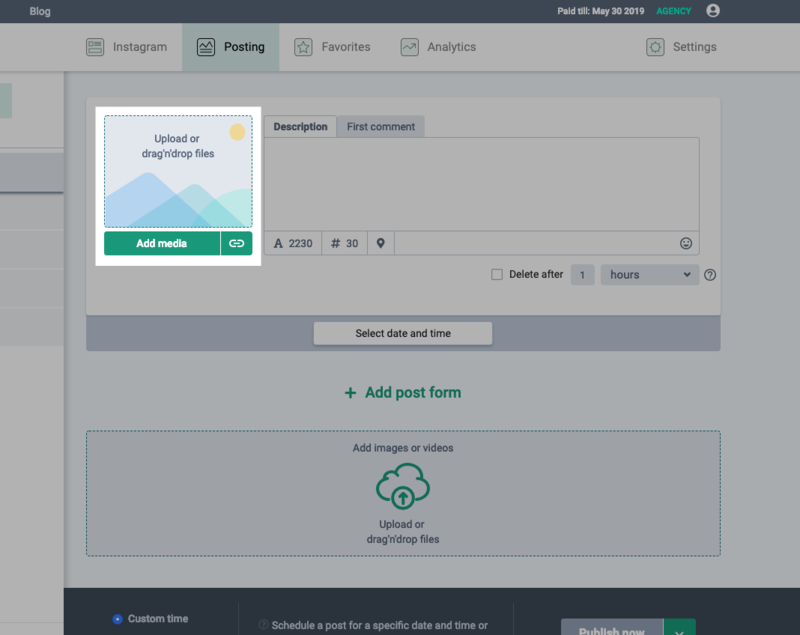 After uploading a file, you can crop it according to the social media restrictions and your own preferences by selecting the relevant time period. Next, you can select a preview/cover for a video – play the video and stop it when you reach the piece you need or select a cover form your images.